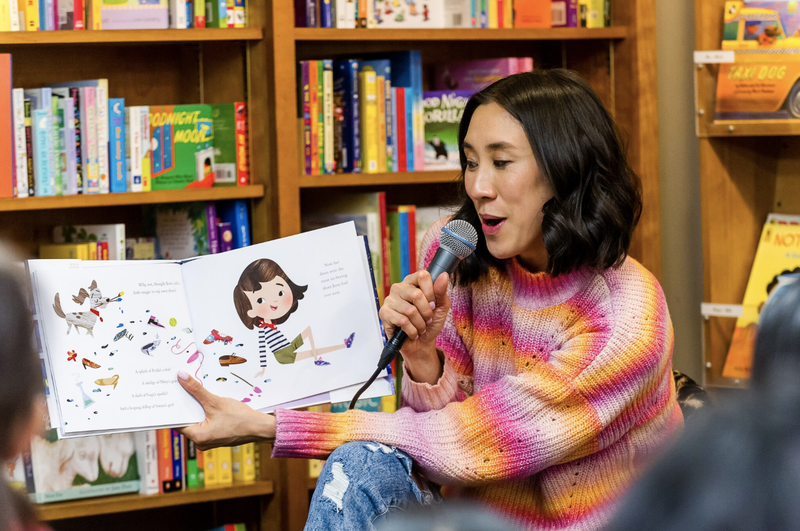 Instagram's director of fashion partnerships and newly-minted children's book author Eva Chen exclusively chatted with Capitol File about her latest book, Juno Valentine and the Magical Shoes, and how fashion can serve as a tool of empowerment for women. Juno Valentine and the Magical Shoes by Eva Chen, illustrated by Derek Desierto. EVA CHEN: I always wanted to write books growing up. Like my whole life. Even when I was her age (referring to her daughter Ren) I loved to read. I just loved everything about books and the experience of consuming books. So for me, I always wanted to write books, but I just never really felt like it was the right time and then I think around 2016 there was a lot happening in politics. There was a lot happening just in the world as a whole and for me I really felt like a book that had strong women characters and different sources of inspiration felt like the right time for me. Writing a book about strong female characters, but also in a format that kids will hopefully like because I think that there are a lot of amazing books about strong characters but then you want something that kids will want to read over and over again that feels lightweight and fun and zippy. But I also wanted to write something that parents would appreciate, both for the message but also if you love fashion, there’s a lot of different fashion messages in there for people to digest and to enjoy. There’s a lot of secret shout outs to Gucci, Louis Vuitton, Stella McCartney, Alexander McQueen, Victoria Beckham, there’s tons of little fashion, what I call, “Easter Eggs” in there. So it’s really fun. D.C. is considered by many to be the power capitol and it's so inspiring to see the use of fashion as a tool for empowerment. What was your approach in blending the two throughout the story? It’s so hard because I think that we’re in a time where a lot of decisions are being made that will have impact on the next generation of boys and girls. So this book, even though it’s about magic shoes and it’s written for four to seven year olds, I still want it to hopefully leave an imprint in a child’s mind. I know the books that I read when I was six or seven years old, I remember them and they had messages. So when you’re reading Oh, the Places You’ll Go! by Dr. Seuss, what does that tell you? It tells you that the sky’s the limit and you’ll have ups and downs, but you’ll still go places. Or when you’re reading the book Are You My Mother [by P. D. Eastman], it’s you only have one mother, she will always come find you and she loves you. So books have a lot of messages. You’ve mentioned that writing a children’s book was something you always wanted to do. Clearly you’ve done a lot throughout your career, but for the moms out there who are on the fence about pursuing their dreams, and it seems so far away, do you have any advice for them? EC: You know what’s funny? I was reading a story recently in some reputable fancy publication and it was talking about how a lot of moms now are creating businesses inspired by being a mom. And I read that and it totally made sense to me. I know so many entrepreneurs and successful ones who became who they are after becoming a mom. I think moms are, maybe not gifted, but forced to learn how to adapt, how to multitask, and also how to ruthlessly prioritize. I think those are a lot of skills that obviously would help a woman in the workplace. I think that the first thing that moms need to do, number one, is support each other, so for the moms out there who are thinking about launching a business whether as a jewelry designer or they have an idea for a start up, tap into the network of moms, whether its your Facebook moms group or whether its other moms at the school that you’re going to. I think the natural inclination for a lot of moms is to want to help each other. I hope that women will want to help each other period. And girls want to help each other. And kids Ren’s age will want to help each other. Right now women should be fostering connections with other women and finding their support networks. If there’s an absence of any organized formal governmental support, it’s really important for us to create networks within our own community and with our own friends and family. If you don’t have the family in town, create friends who function as family.